Buttercup is the friendliest cow you’ll ever meet! And she just loves to sing. In fact, all she’s ever wanted is to be a Country-Western star. So, when she hears there is going to be a competition in Nashbull, she hoofs it as quick as she can! But she’s got a long way to go and a lot of paddocks to cross to get there! 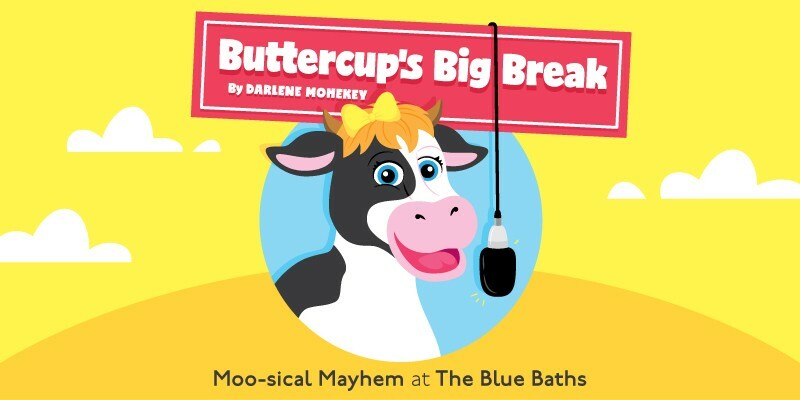 Join Buttercup, Tyra Shanks, Whitney Gooseton, Pavatrotti and more, on this madcap moo-sical adventure for the whole family at The Blue Baths. Will Buttercup make it to the competition? Will she win?? Will we milk these gags for all they are worth??? Probably. But it’s gonna take a lot of udder determination. Tickets on sale now for this School Holidays! Be quick! Group bookings, reserve your seats now, please email - info@bluebaths.co.nz. Available on arrival – popcorn, light food and refreshments, including espresso coffee.